The steps that led up to the top terrace were removed to be used to lead down to the lower terrace. New steps have recently been replaced and the entrance to the top terrace opened. 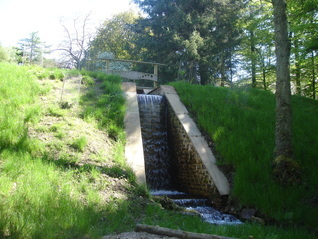 This image of the newly installed cascade was taken in May 2008. This is the cascade in May 2016 after it had been reconstructed to be more in keeping.